London’s most important culinary event of 2011 was the opening in February of Dinner by Heston Blumenthal in the Mandarin Oriental Hotel in Knightsbridge. We finally ate there for lunch this past Sunday. It is truly a destination dining event and should be included with Westminster Abbey and The Tower of London at the top of any London itinerary. A springtime Sunday lunch was the perfect time to enjoy the views of Hyde Park. The menu is a collection of contemporary interpretations of historic British recipes dating as far back as the late fourteenth century. Each item has a story and the staff is well-versed in the history. 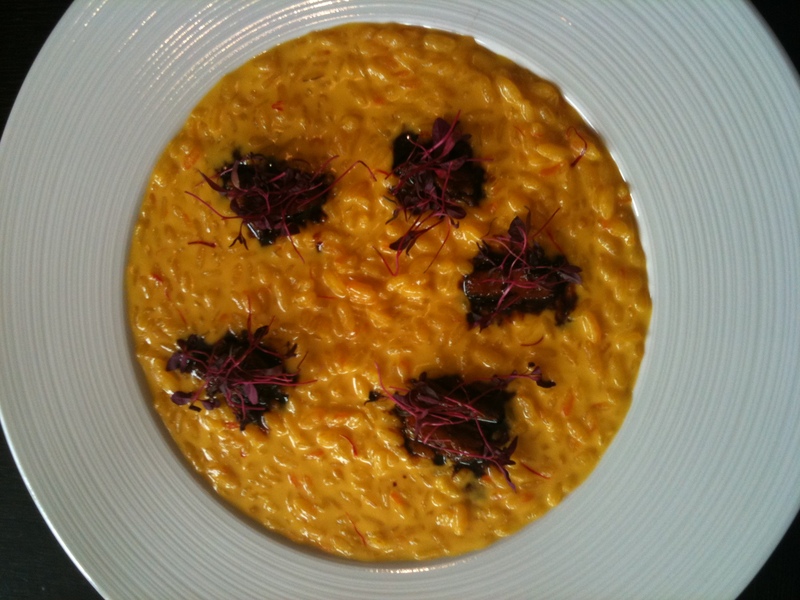 My starter, Rice and Flesh, dated c. 1390, was a delicious saffron risotto with touches of calf tail and red wine. My wife had the signature Meat Fruit starter, c. 1500, which consisted of a silky chicken liver parfait shaped like a tangerine. My daughter loved the Spiced Pigeon main course, c.1780, cooked in ale and accompanied by artichokes. Our amazing desserts included the Tipsy Cake, c. 1810, with spit roast pineapple, and Lychee Frozen Ice, c. 1590, with rosehip jam, barberrie granite and red currant. Our Sunday lunch was a unique and entertaining experience, more than just a meal, and equal to the best theatre, museum, concert or sporting event. Don’t miss it. This entry was posted in Food, Travel and tagged Dinner, Food, Heston Blumenthal, Hyde Park London, Knightsbridge, London, Sunday roast, Tipsy Cake, Travel. Bookmark the permalink. Great post and great experience of such traditional fare! Here’s some Fat Duck trivia – Nathan Myhrvold, author of Modernist Cuisine: The Art and Science of Cooking and founder of The Cooking Lab in Bellevue, Washington (USA), met his co-authors, chefs Chris Young and Maxime Bilet while he was dining at The Fat Duck. The 6-volume, 2438-page tome, with thousands of original images reinvents cooking and the sensory experience of food. In March, I met the authors at a presentation/book signing/tasting in NYC; and, last week, I attended a demo class/tasting/discussion with Maxime Bilet at the Experimental Cuisine Collective’s Symposium at NYU. With their methods of combining cooking and science, it’s just amazing how satisfying a very small portion can be and how long the cooking process can take. Great post! I loved the meat fruit and tipsy cake when I went to Dinner as well!